We are a leading Manufacturer of pharma plastic bottle and plastic bottles for pharmaceutical industry from Mumbai, India. 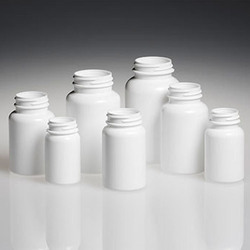 Backed ourselves with sound amenities and talented personnel, we have emerged as one of the leading firms of superior quality of Plastic Bottles for Pharmaceutical Industry. Offered bottles are manufactured using optimum quality raw material and modern technology by our skilled professionals. In order to fulfill the requirements of the clients, these bottles are available in diversified designs and sizes. Besides, clients can avail these bottles from us at affordable prices.